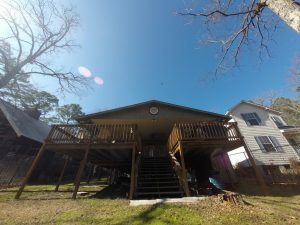 This cozy cabin is located on Lake O' the Pines, yet is only a 10 minute drive to Historic Jefferson, Texas, making it an ideal vacation spot for fisherman, families and shoppers alike. This vacation rental has something for everyone. Our vacation home sleeps up to six to seven with ease. One bedroom has a queen bed; the other has two bunk beds with full size beds on the bottom and twins on top. And if you need one more bed, the sofa in the living room opens to a single sleeper. There is a full bath inside, as well as a full bath just off the deck out back. The complete kitchen is stocked by a ‘foodie’ so you should have all of the appliances and utensils you need to prepare just about any type of meal you desire. Just bring your own food and have your favorite meal inside or out. 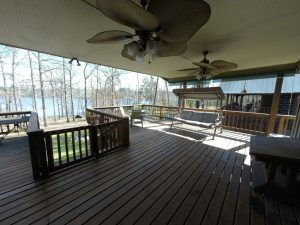 The focal point of the cabin is the large party deck overlooking the lake. Enjoy every season at Lake O' The Pines. The Dogwoods are beautiful in the spring and the Fall foliage is spectacular. This is an excellent rental for the numerous fishing tournaments held on Lake O' the Pines each year. Tie your boat up in back and enjoy the lake every day without pulling your boat in and out every day. Come enjoy this relaxing, cozy cabin nestled in the woods on the lake with friends and family, or have a romantic weekend with the one you love!! 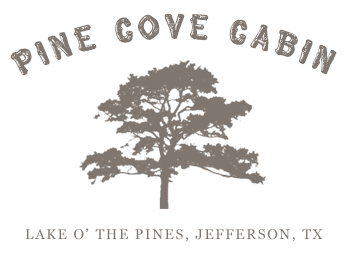 If you are looking for a Vacation Rental on Lake O' The Pines then Pine Cove Cabin is the spot for you. Available by the day, week or month, Pine Cove Cabin is perfect for your East Texas get away Contact us today to reserve your time at Pine Cove Cabin Vacation Rental on Lake O' the Pines.